There is a maximum of 14 players per team. There is a minimum of 7 players per team. Seven players are on the field for all plays. AGO alumni, actives, and pledges are eligible players. Chapters with insufficient numbers to field a single team may combine to form one “mutt” team. Teams, with the minimum of 7 players ready to play, that do not show up on time will NOT be guaranteed a spot in the tournament. Each team must designate a captain, a liaison to the Kappa Chapter for the team’s conduct as well as field assignments/game times and tournament-related administration. Two tournament champions will be crowned, one active team and one alumni team. The tournament structure is typically pool play followed by a single-elimination playoff bracket. 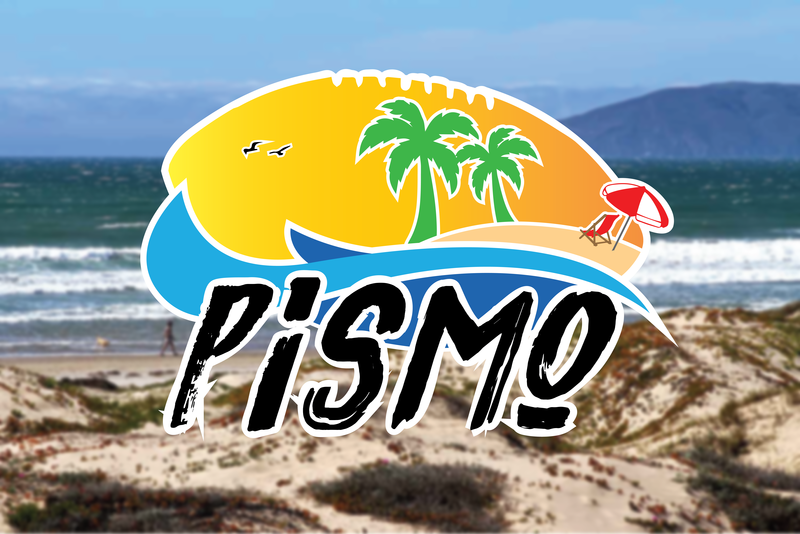 The exact structure varies from year-to-year based on the number alumni and active teams at Pismo that year. Wild card teams that do not “win” their pool, may also advance to the playoff bracket. (up to a max of +/- 15 points per game). The actual seeding will be drawn from a hat on the morning of play. “United” teams are defined as actives plus alumni from the same chapter. Pool play may mix alumni, active, and “united” teams. Only true all-alumni teams can advance to the alumni playoff bracket. Only true all-active teams can advance to the active playoff bracket. Most games will be self-refereed by the two teams playing. The highest standard of Christian sportsmanship and honesty is expected. If there is a point of contention regarding the ball crossing the first down line or the end zone line, something too close to clearly determine, then the offense shall automatically prevail. Any disagreements should be sorted out by the team captains, or if they can’t agree then a do-over will take place. Playoff bracket games may be refereed by 1-4 brothers of a neutral chapter, if they are available, but the same level of Christian sportsmanship and honesty is expected regardless. One referee or fan from either team should keep the game clock (on a stop-watch, regular watch, or cell phone), and another should keep the 25-second play clock. Each game consists of two 25-minute running clock halves, with a 5 minute half-time. If needed, the time of halves may be shortened to finish the tournament before dusk or extended slightly if extra time is available. Each team has 25 seconds to hike the ball after it is placed by the referee. Each team has 1 time-out per half, which does stop the game clock. Unused time-outs do not carry over. A player may protect his flags by stiff-arming the torso of an opponent. A player may not protect his flags by swatting arms or flag guarding. If a player obtains the ball without wearing his flags, he is down with any one-hand touch by the opponent. This also applies if flags accidentally drop off without being de-flagged while running with the ball. Running or passing the ball into the end zone earns 6 points. 1 point is earned for running or passing the ball in from 4 yards/paces. 2 points are earned for running or passing the ball in from 8 yards/paces. Scoring a safety earns 2 points. OVERTIME: California Tie Breaker is in effect. INTERCEPTION ON AN EXTRA POINT ATTEMPT: May be returned by the defense for 2 points. If interception is not returned all the way to the end zone, then a normal kick-off placement follows. Kickoffs will only take place at the beginning of each half; otherwise there will be no actual kick-offs. Rather at kickoff time, the receiving team shall get the ball at the first cone with 3/4ths of the field in front of them. If a kickoff is thrown out of bounds (including any bounce out of bounds), the receiving team will start with the ball at the first set of cones or, if advantageous for the receiving team, where the ball went out of bounds. Punts are normal. The ball can be thrown or kicked. No punt fakes are allowed. No one can move on the line until the ball is thrown. The receiving team can have up to two players back to receive the punt. PUNTS: NO one can move till the ball is kicked. Punts that hit the ground may be picked up and advanced. The playing field is divided up into fourths with two 10-yard end zones, 30 paces wide, and 14 paces between cones. Teams must advance to the next cone to get a first down. 10 yard penalty assessed from the line of scrimmage. EQUIPMENT: All chapters of Alpha Gamma Omega must use a “college” or “pro-size” football. ALL PLAYERS ARE ELIGIBLE: All players are eligible receivers. MOTION: Only one player can be in motion at a time. Only one player can be in motion at the snap of the ball. DEFENSIVE LINE: The inside knee of defensive end on the line, must be in line with the outside knee of the offensive lineman. Alternatively, a blitzing CB/LB could be farther out as long as he’s at least 2 whole steps off the line. SNAPS: Bad snaps can be picked up off the ground only by the Quarterback. This is not considered a fumble and can NOT be recovered by the opposing team. The ball is considered dead at the spot if an opposing defender is touching the ball while it is on the ground. CENTER: You cannot touch the center until he takes one step toward his pattern, or assumes a blocking position. BLOCKING should only involve pushing on body, no contact to the head allowed. DIVING: Diving to pull a flag or make a tag is legal. Diving to block is illegal. PASSER’S arm in motion and ball is in his hand: the passer is down if deflagged. KNEE TOUCHES GROUND: If a ball carrier’s knee touches the ground, the ball is dead at the spot. POSITION of the ball when tagged or deflagged is the mark for the succeeding down. BUMPING A RECEIVER: One bump off the line is permitted from the line of scrimmage up to 5 yards. BLOCKING down field when the ball is in the air, is an offensive pass interference penalty. It does not matter if the ball is behind the line of scrimmage or beyond. ONE FOOT DOWN, when a receiver goes in the air for a catch near the sidelines, he must have at least one foot in bounds when he hits the ground. OBSTRUCTION OF THE RUNNER: The defensive player cannot hold, grasp or stop the forward progress of a runner in their attempt to make a tag or pull a flag. STRIPPING THE BALL: The defense must play the flags, not the ball. If the ball is stripped, it is down at the spot and the offense keeps possession. FUMBLES/ INCOMPLETE PITCHES: Dead at the spot of the fumble/ pitch.